The Written Word: The Silver Surfer's Little Brother. The Silver Surfer says, "Hey, li'l brother! Come on out from under that poopy paint!" 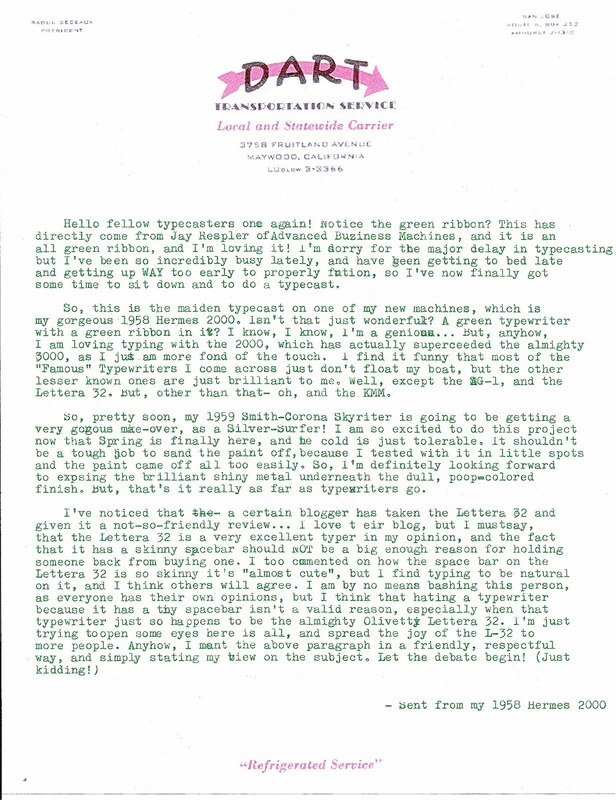 Only in the typosphere could you have dueling typed pages about the merits of typewriter spacebars. I love it. I haven't gotten to try a 32, but the Studio 44 is very good - right between the SM9 and H3K in feel. It has a skinny spacebar too - they must have thought it looked nice. Ryan let me try his 22 I think, and for its size it felt pretty solid and smooth. Ha, "refrigerated service"... great unintentionally 'cold' footer quote there. Wonder if Dart thought carefully about that one... Better: "everything is cold but the service". Hey, lets hear it for skinny space bars everywhere, YIPEEEEEE! I don't hate the 32, I just hate typing on it. KIDDING! I would definitely pick it up if I came across it in good condition at a thrift store. I've yet to meet a typewriter I *actually* loathed, the 32 just doesn't fit my particular typing style quite like a Hermes or an Olympia. The OU21 I actually liked quite a lot, and though it has a very similar spacebar I didn't miss it as much. I think it has more to do with the curvature of the machine. I'm really loving the green ribbon on the Hermes 2000... I wish our 2000 didn't have the terrible skipping problem it does! Thanks, Tori! I guess I misunderstood your post on your blog, as I'm almost positive that it's impossible for anyone to not like the Lettera 32. If you're not peachy keen on it, why not try a Lettera 22? I've typed on them before, and they're pretty nice as well, but the 32 fits my style a little better. 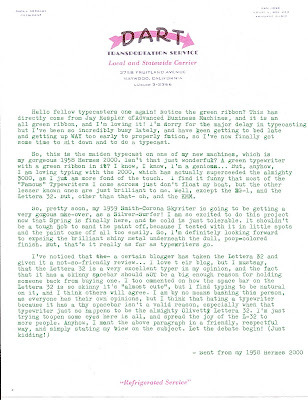 But, i think I've met a typewriter I've actually loathed- modern day electronic typewriters that you see in Staples!